==> PLEASE NOTE: As of April 22, 2015 the user agent workaround for Chrome and Firefox no longer works to display the pre-March 2014 page look. Unfortunately I don't believe there's any way to return to the pre-"new experience" look. I'm not really liking the newly rolled out Flickr photo page. I've been pretty lukewarm on many of the other changes this past year, probably because like many people I just don't like change. But the new photo page design is really killing my experience since it went live for in late March 2014. For me the new page style makes comments, descriptions and any other text completely unreadable. I love spending time on Flickr, but I hate the eye strain the new look gives me. To return to the old look, I could switch to a language other than English, but that will only work until the site redesign is rolled out to non-English language versions of Flickr. Instead, I found a way of tricking Flickr into thinking I have an older browser that isn't advanced enough to be able to display the new page design. The result of this incompatibility is that Flickr will now display the old page design. Keyboard shortcuts even seem to work properly using this method, and I really love having my comments and other text back down below the photo in a black-on-white theme, where I can actually read them. I found and tested this solution on a 2013 MacBook Pro using current versions of Chrome and Firefox. There may be a similar way to implement this hack on other browsers (Internet Explorer, Safari, Opera, etc) but I didn't test those, so I can't provide any guidance there. This is not rocket science, but you are going to be making changes to your browser's behavior. Do so at your own risk! In spite of the fact that this took me 10 minutes to sort out and test AND in spite of not having broken my browsers, I cannot guarantee the same for you. If you try this hack and it doesn't work, simply uninstall the browser plug-ins/extensions I'll discuss below and your browser should return to "normal." Having said all that, and having wholly and completely disclaimed any responsibility, let me just say this: you can do it. 2. Download Ultimate User Agent Switcher from the Chrome Web Store (link). 3. Once installed, go to your extensions bar and choose Ultimate User Agent Switcher. A menu will pop up. 4. First off, check the boxes that says "Activate Now" (top of the menu) and "Enable Pattern" (bottom of the menu). Then choose "Options," which will open another page. 5. Go half way down the Options page to the "* User pattern" section and check the "Enable" box. You'll see that a patter already exists for Google. You can click the red X to the right of that to delete it. 8. Now click "Add New" to add this pattern and user agent string. 9. Click the "Save (Alt+F1)" button near the top of the extension options page. You're done. 10. Go to a Flickr photo page and you should see the pre-March 2014 page design/layout. 2. Download ua-site-switch from Mozilla (link). 3. Once installed, you will see a little yellow construction helmet icon in the lower right of your Firefox browser window. 4. Go to www.flickr.com and click the yellow hat to bring up the extension options. 5. Choose "This site" so that the broswer trick only applies to anything that starts with "www.flickr.com." 7. Hit enter to save the change. You're done. 8. 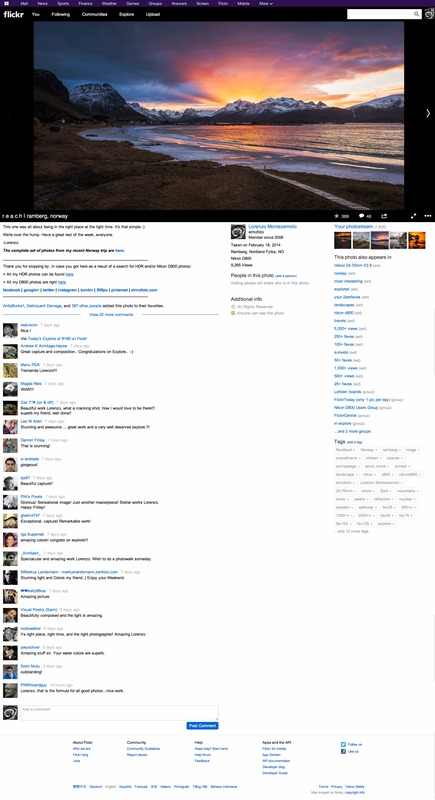 Go to a Flickr photo page and you should see the pre-March 2014 page design/layout. Once you implement this hack, you'll probably receive a warning that you're using an unsupported browser when you first go to Flickr. Simply click the X to close that message and it should not appear again (unless you clear your cookies, in which case you may see it again). This hack basically makes your browser look like Internet Explorer 9, which does not have the functionality required to support the new photo page layout. In order to allow you to still view Flickr pages, Flickr displays the page in an Internet Explorer 9 compatible format, which means no new layout.